The reimposition of US secondary sanctions has compelled Tehran to look for ways to reduce their negative impact. According to Iranian officials, one of the strategies is to increase trade and interaction with its neighbors. This is not new to Iran, as the country has pursued a policy of improving relations with immediate neighbors including investments in increased energy interdependency. Yet the past rationale for regional policy was more focused on security considerations. This time, the rationale has been expanded to include trade and economic reasons. However, this strategy is facing challenges on multiple fronts, most importantly due to the existing tensions between Iran and her southern Arab region. In fact, deputy head of the Iran-China Chamber of Commerce Majid Reza Hariri recently criticized the strategy of focusing on immediate neighbors by highlighting the tensions and disagreements that Iran has with a number of immediate neighbors. Nonetheless, Tehran can benefit from closer trade and investment ties with some of its neighbors. The best case where the merger of security and economic rationales can be witnessed is in Iran-Iraq relations. It is not an exaggeration to say that Iran-Iraq relations present the most significant regional axis in West Asia. One should always keep in mind that the two states fought an eight-year war in the 1980s under Saddam Hussein, but have managed to establish a unique relationship including expanding economic relations. In fact, in the first seven months of the current Iranian year (March 21-October 22, 2018), Iraq was the most important export market for non-crude Iranian exports with close to $6 billion of exports. 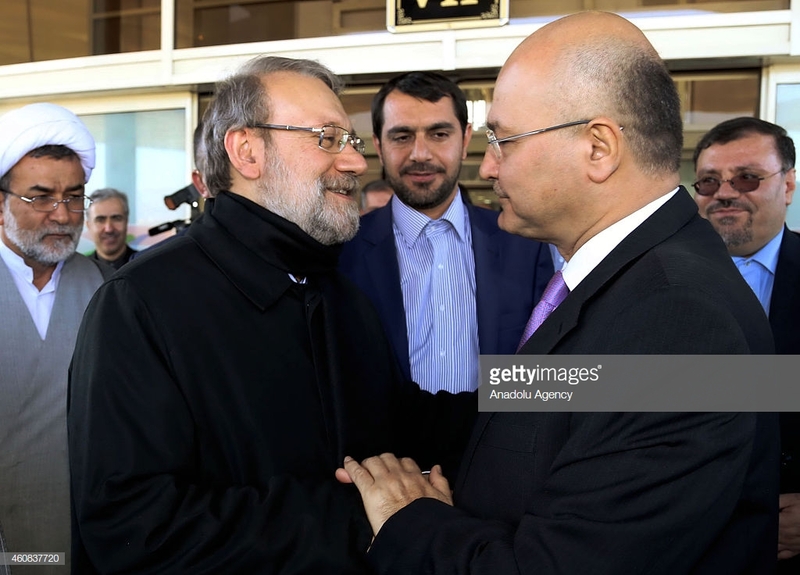 A recent visit by new Iraqi President Barham Salih to Tehran and his high-level meetings across the Iranian power structure was another reminder of the nature of this relationship and its significance for Iran. The two sides agreed to elevate annual trade volume from the current $12 billion to $20 billion, which would be a major boost — especially if it includes a major growth in Iranian exports to Iraq. The question is what opportunities and obstacles are in store for the planned expansion of trade relations. Iraq and Iran not only share the longest respective border with any neighbor in both countries, but they also have substantial ethnic, cultural and religious ties. Furthermore, due to the existence of a number of security challenges in the region, the two states converge on a number of geopolitical and security interests. While the existence of vast hydrocarbon reserves could be a reason for competition, so far the energy sector has brought the two nations closer — particularly as Iran has large reserves of natural gas that Iraq needs for its electricity generation. Interestingly, the significance of Iran’s role in Iraq’s energy supplies is also clear to the US administration, which granted Iraq a 45-day waiver to import natural gas and electricity from Iran. These waivers will have to be extended, as there are limited alternatives to Iran’s current exports to Iraq due to missing infrastructure. Evidently, in the longer run, Iraq could find substitutes, but the question is whether Baghdad would risk the deepening ties with Tehran in order to appease Washington. It will be a difficult balancing act as Baghdad needs both powers, but it is safe to expect that Baghdad will look for ways not to undermine the close ties with Tehran. Interestingly, Russian representative at the UN Security Council Vasily Nebenzya has supported Iraq’s decision to continue trading with Iran. He was quoted as saying that Iraq is recovering and Moscow supports a positive Baghdad approach to ensure its security and improve its economy. The areas of developing win-win scenarios are not limited to Iranian electricity and natural gas exports. There are also a large number of shared oil fields that are being developed. The two sides have agreed to jointly develop these fields, which will allow them to effectively utilize the resources and enhance the wealth of both nations. This platform may also be an opportunity for the Iranian side to inject some of the latest technologies into the development of Iran’s oil sector by studying how international companies are managing the Iraqi side of the joint fields. There is also Iran’s role in ongoing oil and petroleum product swaps involving a triangle of Iraq, Iran and Iraqi Kurdistan. The two sides have furthermore signed an agreement to allow Iranian companies to assist Iraqi contractors in the field of expanding the capacity of liquefied petroleum gas (LPG) production in Iraq, especially as LPG will play a growing role in the transportation sector and residential energy consumption in the country. Beyond the energy sector, there are also relevant investments and initiatives on both sides in order to deepen the bilateral relations. Apart from major Iranian investments in Shiite holy sites in Iraq, Tehran has also invested in a number of medical centers in border regions to attract medical tourism from Iraq. Furthermore, the two sides have set up numerous border markets to institutionalize cross-border trade and dissuade communities from engaging in smuggling activities. In economic and cultural terms, one core interest on the Iranian side is also to provide access to Iranian pilgrims to holy sites in Iraq. The combination of religious, cultural and health tourism is generating revenues and creating jobs on both sides. Another important utility of the close ties to Iraq will be the opportunity for Iranian companies to use their subsidiaries in Iraq as a front to secure the products and services that may not be available to Iran directly. The process of using Iraqi companies could in many cases replace the past path of going through front companies in the United Arab Emirates. How US sanctions enforcers will try to undercut such paths remains to be seen, but establishing front companies in neighboring jurisdictions is an important lever in Iran’s attempts not to allow the United States to undermine the country’s economic and technological development. The two sides are also planning to create a joint bank that will facilitate payments and transactions between the two economies in the face of increased US pressure on international banks. Another idea that has been promoted in bilateral relations has included the establishment of an “industrial complex” in one of the border regions that could house joint ventures and help the private sectors of the two nations to cooperate and develop solutions needed in the region. All of these realities and plans will now be challenged by the reimposed US sanctions on Iran. Not all activities will be sanctionable, but there will be activities that the US side will try to sanction — which will, in turn, create challenges for the Iraqi side that need to balance relations with Iran and the United States. Other neighboring countries, such as Turkey, will also face similar challenges. In his recent meeting with Salih, Supreme Leader Ayatollah Ali Khamenei stated, “A strong, independent and advanced Iraq is very important for Iran,” which reflects the sentiments of the key political power centers in Iran. One key driver of this sentiment is the growing appreciation in Tehran that the more indispensable Iran becomes as a trading partner and an energy source or a trade hub for its immediate neighbors, the more difficult it will be to sanction and undermine the country. Thus, it is valid to assume that US President Donald Trump’s ill-advised policy on Iran will compel Tehran to deepen its ties with immediate neighbors and make itself more and more indispensable in the region. Feature image: New Iraqi President Bahram Salih meeting Iranian Majles speaker Ali Larijani earlier. Getty images. Posted on Al Monitor November 23, 2018.